On Baruch Spinoza's Ethics (1677), books 1 and 2. Time warp to 2010 when Mark, Seth, and Wes recorded this lo-fi burst of energy, made available to you now to kick of our June Spinoza-fest, with two full discussions coming out over the next four weeks on Spinoza's Tractatus Theologico-Politicus. Dylan and Mark have recorded a new introduction connecting the two works. God is everything, therefore the world is God as apprehended through some particular attributes, namely insofar as one of his aspects is infinite space (extension, i.e. matter) and insofar as one of his aspects is mind (our minds being chunks or "modes" of the big God mind). Read a free version online or buy the book . One place to read the earlier Spinoza book Mark refers to, A Short Treatise on God, Man, and his Well-Being (1660), is here. The Karen Armstrong book referred to is The Case for God , and at the end Wes recommends Matthew Stewart's The Courtier and the Heretic: Leibniz, Spinoza, and the Fate of God in the Modern World . Seth also brings up Giles Deluze's Spinoza: Practical Philosophy . The dumbed down, non-geometric presentation of the Ethics that I talk about is here . Ep. 25 which continues this discussion is now available for $1 Patreon subscribers: Visit patreon.com/partiallyexaminedlife. Or publicly share this post from our Facebook page that links to this episode before 6/5 and we'll send you the link to ep. 25 via FB messenger (be sure to check "message requests"). PEL Citizens get all of our behind-the-firewall offerings, so that's definitely your best bet. Please support PEL! Spinoza picture by Corey Mohler. This reissue is made possible by the St. John's College Graduate Institute: partiallyexaminedlife.com/sjcgi. Visit Talkspace.com/examined; use code "EXAMINED" for 30% off your first month of online therapy. – In Spinoza, everything comes in 3-s, so one should forget about the dialectics, and instead think in TRIADS (the expression as a triad; the first triad of the expression – substance, attribute, essence; the second triad of the expression – the perfect, the infinite, the apsolute; third triad – essence as the power, that in which an essence is, the power to be affected). In her recent talk Dr. Anna Posazhennikova (RHUL – Nobel Prize 2016: the rise of topology or what’s in a quantum vortex) said that some future Nobel Prize will be won by someone who will explain why everything in the physics comes in 3-s (atom – electron, neutron, proton). – When it comes to the question of attributes, it is important to understand that humans know only two attributes, that of extension, and that of thought, (For example, Wes, in his actual existence, is a mode of the attribute of the extension of the one and the only substance, and when I think of Wes, when I have an idea of Wes, he is a mode of the attribute of thought of the same substance). BUT GOD KNOWS INFINITE NUMBER OF ATTRIBUTES! And we humans don’t have any idea what those other attributes could be. – There are three genres of knowledge, and most of Ethics is written in the second genre, but in the book V, precisely after the V, 21, Spinoza writes from the perspective of the third genre of knowledge, so one has to watch out for the possible contradictions of the meaning. – One can, whenever Spinoza mentions the term God, think of it as a concept, and call it, for example, Ecology, or some other similar concept, and thus avoid a (possible) theological sense of the meaning of the text. Hope that someone will find these suggestions helpful. All this “wisdom” I read in the first Deleuze’s book on Spinoza (Expressionism in Philosophy: Spinoza), the one that you didn’t mention, but I would suggest that it is much more important. Spinoza’s philosophy is a minefield, but when one comes across he becomes a different man. Greetings from the Old Continent! Extension is one of the infinitely many attributes of God – as infinite self-causing substance – precisely because (rather than despite of the fact that) extension can by definition be divided infinitely, yet always remains extension. Spinoza’s God always remains indivisibly God, despite being divisible into infinitely many attributes, in exactly the same way that extension ‘as such’ can always be divided while still remaining extension (or the loaf of bread always divides into smaller slices of bread). The solution lies exactly where the insoluble contradiction seems to appear. All the things we want to assume about things – such as their extension and their infinite divisibility – cease to generate paradoxes and contradictions when we no longer think of things as separate substances in the first place and instead view them as modes (expressions) of a single substance. The transcendence of this substance is its immanence: its power of dividing while remaining the same. Which is all a way of saying: you can’t make the infinite an object, but you also can’t be anywhere but ‘in’ the infinite. And that’s all she wrote. It makes irresistible sense to me (until you think about quantum mechanics, a task for which, of course, Spinoza’s lenses were not sufficiently powerful. sorry for the rave, but Spinoza just like blew my mind. again. 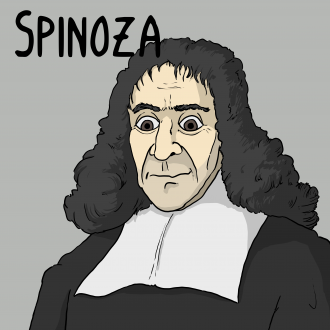 I really love Spinoza! This was a great invitation to revisit older PEL content, Mark & Co.. A couple years ago — when I first stumbled upon your website — I was binge-consuming episodes faster than I could really process them. Now that I don’t have as much general philosophical background knowledge to catch up on, it’s fun and interesting to peruse your earlier adventures in blogging and podcasting. Moreover, since you’ve now got an enviable digital-library catalogued here, it’s only natural that you can start circling back and tying older episodes to new. I hope you will consider making it at least an occasional habit, and more often than that if possible. Excellent comments here, and this was the best of all PEL Spinoza podcasts because the focus was on his metaphysics which distinguishes Spinoza as a true pioneer of the philosophy of immanence as Seth stated. Unfortunately as the later podcasts have progressed, there has been a regression into the socio-cultural history of the religious and traditional trappings which are in direct opposition to his metaphysics. Once Spinoza established that there is only one substance, the transcendental God fell from the sky and the nature of the universe rose to an immanent divinity. Of course God (substance) is all one and is the necessary condition for existence. Then what are things, if not actual extensions of God as well as virtual, conceptual thoughts (essence)? Extension and thought are two distinct essences that have absolutely nothing in common. The modes or expressions of extension are physical bodies; the modes of thought are ideas. Any idea is an integral part of an infinite series of ideas and is determined by the nature of thought and its laws, along with its relations to other ideas. There is, in other words, no causal interaction between bodies and ideas, between the physical and the mental. There is, however, a thoroughgoing correlation and parallelism between the two series. Therefore what explains causation itself? Spinoza’s answer is conceptual in nature. Causal relations obtain in virtue of conceptual connections between causal relata. God’s only determinism is to be consistent with and preserve his nature (connatus). There is no classical physical determinism present in Spinoza. On the other hand humans can be determined by passions: Our affects are divided into actions and passions. When the cause of an event lies in our own nature—more particularly, our knowledge or adequate ideas—then it is a case of the mind acting, providing autonomy and freedom. On the other hand, when something happens in us the cause of which lies outside of our nature, then we are passive and being acted upon. Our virtue, therefore, consists in the pursuit of knowledge and understanding (Spinoza’s intuition), of adequate ideas. The best kind of knowledge is a purely intellectual intuition of the essences of things, a “third kind of knowledge”—beyond both random experience and ratiocination. Things are apprehended in their conceptual and causal relationship to the universal essences (thought and extension) and the eternal laws of nature. One can take the religion and the concept of God out of Spinoza’s equation, like Descartes before him who also wrote in code to protect himself from spiritual demagogues, and provide as pure an atheistic perspective as well as a theistic perspective on the nature of the universe. The only difference is that theists like their God, and atheiests like their no-God. As Spinoza observes, it is all in how your concepts affect your actions whether you are thinking well or poorly (intuition), in accordance with the the nature of nature based on loving your neighbor and enacting social justice based on charity–not whether you are a theist or an atheist. You know you’re commenting on a super old episode, right? I think we’ve in general moved to excluding most of this, but talking about it when it seems necessary for handling the philosophy. See what you think of our treatment of Pascal in our most recent episode. Thanks for listening!